This article was first published in 2009. ‘Electric Porsche’. It sounds like an oxymoron – until you realise that some of the very first vehicles that Dr Porsche developed were electric... 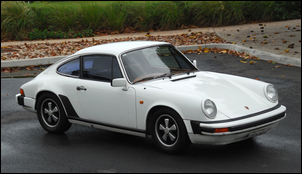 But this 1977 911SC started life with the traditional flat six petrol engine - it was only after many years on the road that the car had its electric conversion. 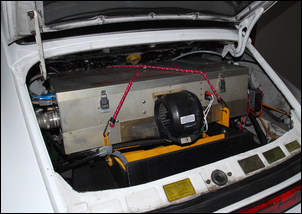 A US-sourced AC Propulsion Gen 1 electric conversion kit was fitted, consisting of a 150kW induction motor (driving through the original Porsche gearbox), a dedicated controller and a lead-acid battery system. That all took place years ago: fast forward to the present and the car’s just received a new gearbox, new throttle mechanism and a host of refinements. So what’s an electric Porsche like? 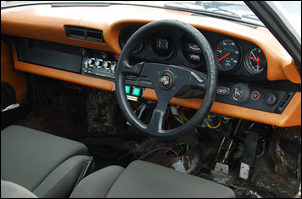 No 32 year old Porsche is going to be a paragon of civility – and since owner Dimitri Lajovic has stripped the car of carpet and sound insulation, that applies in spades. Forget the idea of all electric cars being quiet and refined – this one isn’t! 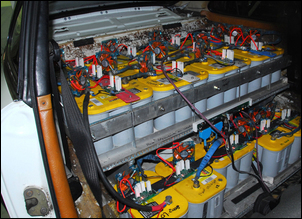 The batteries are distributed all over the car. There are 28 spiral-wound lead acid ‘absorbed glass mat’ designs (better known as Optima ‘yellow tops’), each with a nominal capacity of 55 amp-hours. However, GWG Creative Engineering (the Brisbane company responsible for the car in its latest version) suggest that when used for electric vehicles, the capacity of these batteries is actually closer to 25-30 amp-hours. Three batteries are in the back under the engine cover, eight are in the front filling the boot, and 17 are where the back seat once was. Total mass of the car is around 1750kg. 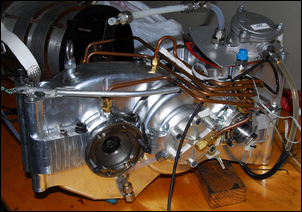 The electric motor is a brushless, 4-pole induction design that uses a copper rotor rather than the more usual aluminium design. It has an output of 220Nm from 0 – 5000 rpm, and the 150kW output applies from 5000 – 12000 rpm. The controller is now a quite old-fashioned analog design. Interestingly, it uses the motor as part of the on-board battery charging circuit (the motor windings act as an inductor in the voltage boost circuit). The controller is cooled by an electric fan while the motor uses two 12V cooling fans. The new gearbox was fully developed in-house by GWG. It comprises a billet alloy housing containing a 10.8:1, two-stage reduction. The gearbox is dry-sumped, using electric suction and pressure pumps. The bearings and gears are force lubricated. Six thermocouples sense temperature and an oil pressure sensor is fitted. These sensors report to an electronics box developed by Tritium, a Brisbane company specialising in electric vehicle motor controllers and allied electronics. This diagnostic data is displayed on a lap-top. The bespoke gearbox works into a Quaife LSD. This type of LSD was chosen as much for its low-backlash design as for its limited slip abilities. 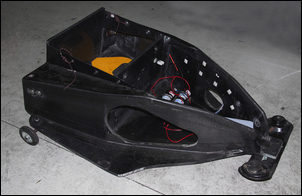 The gearbox and motor are housed in a custom carbon-fibre sub-frame. The driveshafts and CV joints are standard Porsche. So why the need for the new gearbox? Incredibly, the old Porsche gearbox survived being driven in first gear (and at up to 12,000 rpm) for no less than 60,000 kilometres! However, after that distance, its input drive splines were very worn, and the gearbox itself had lots of backlash and clunks. 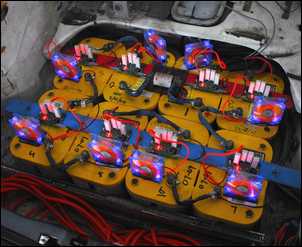 Battery management is by Tritium-developed individual monitors – one fitted to each battery. These units equalise the battery charge, using resistor power shedding. Fans have been fitted to keep the resistors cool. 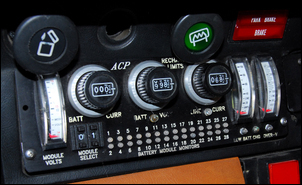 On the dash there are instruments from AC propulsion, including a plus/minus 40 amp ammeter, and another that scales plus/minus 400 amps. There are also read-outs for battery voltage, and motor and controller temps. Peak voltage is 420V, while 360V is normal in cruise, dropping to 320V at full load. An interface is also fitted that allows the user to adjust max charging current and other battery charging parameters. Other recent electronic additions include the use of a current model Honda Civic electronic throttle, interfaced to the AC Propulsion controller, and a new interface for the speedo. Both electronic modules were produced by Tritium. 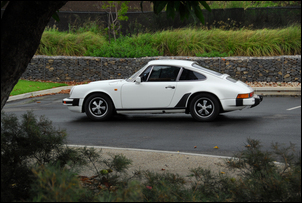 Brakes and suspension are standard ’77 Porsche 911. So in terms of current individually-modified electric cars, the Porsche is an interesting mixture. It’s got a much better electric motor than is usually fitted to conversions (AC induction versus DC brushed), but has an old-fashioned analog controller and lead acid battery pack. But it also has a new built-for-this-application gearbox, some cutting edge electronic interfaces – and all wrapped in a stripped-out Porsche body! So what’s it like on the road? First-up, we must tell you that if you still wonder how good electric cars can be – they can be very good indeed. Off the line the Porsche doesn’t go hard, but in rolling acceleration, the instant torque makes ‘Italian lane changes’ (you just put your foot down and then swap lanes) a breeze. The car is deceptive, not in the way that a very refined, quiet car is deceptive in going faster than you thought it was, but deceptive in that the acceleration is so linear, so constant, that you end up at speeds far quicker than expected in the available time and space. That said, and despite the power and torque characteristics of the electric motor, there still is only 150kW for around 1750kg. The 0-100 km/h time is quoted as being around 8 seconds - that feels about right. However, the in-gear (one gear!) acceleration and response is more like a large capacity V8 capable of 0-100 in the low sixes. However, for us the best on-road aspect was not the acceleration – it was the regen braking. The throttle uses an interesting design. When you’re on the move, lifting the throttle results in regen braking (where the motor becomes a generator and puts juice back into the battery). In normal driving, the ‘zero point’ is about half-way through the accelerator pedal travel. But when you’re stopped, the accelerator behaviour reverts to a normal design, so there’s no dead travel to overcome when you drive off. Strange as it sounds, you don’t notice this change in behaviour – it feels quite natural. The strength of available regen braking can be selected by a dash-mounted slider pot. At its strongest position, you simply never have to touch the hydraulic brakes. 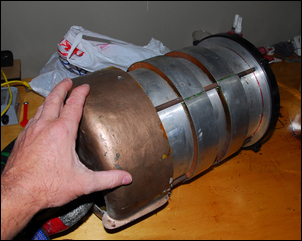 (And that’s a good thing – vacuum for the booster is provided by a noisy electric pump. Stay off the hydraulic brakes and the pump doesn’t operate.) We drove the car for probably 45 minutes in city traffic conditions, gradually winding-up the level of available regen. By the time the drive was nearly over, we were simply revelling in the ability to seamlessly go from very strong acceleration to very strong deceleration, all through the action of a single pedal. It makes driving an elastic, progressive and natural sensation. 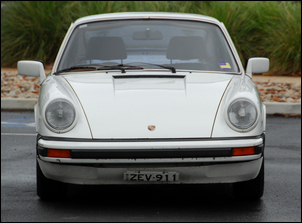 The Porsche is full of rough edges – clearly, owner Dimitri cares little for luxury or low NVH! But even with the road noise, the suspension noise, the gearbox noise and the slight driveline vibration, the electric Porsche is a bewitching drive. Range is about 60 kilometres – fine for most people’s commute – and of course, each night you just plug it into the wall. Would we have one? Nope, not at the ~$50,000 conversion cost and with poorer refinement than even the cheapest secondhand banger of the last 20 years. But does it confirm that performance electric cars are (one) of the ways of the future for pure driving fun? 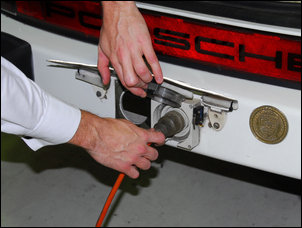 Squirt your intercooler spray for 5, 10 or 20 seconds - all at the press of a single button! So what stuff is worth salvaging out of old air conditioners?